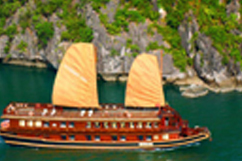 It is designed perfectly in inspiration of Classic Eastern style and finely equipped with modern amenities; Indochina Sail is considered as the most luxury and charming o­ne in Halong bay. 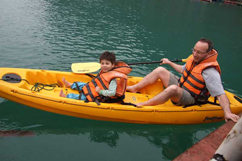 Moreover, our qualified, experienced and highly motivated staffs look forward to make your stay impeccable. 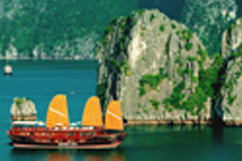 Indochina Sail is proud to be the first choice of many tourists inside and outside Vietnam for their trip to the World Natural Heritage – Halong Bay. 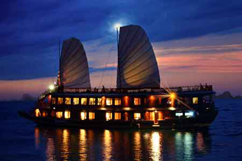 Indochina Sails have the advantages of big sizes with big floors, standard rooms for big groups. International-standard cabin design with rich wooden interior, comfortable bedding with luxuriant linens and marble ensuite bathroom. In addition to larger size, Deluxe cabins offer Second Deck location and enahanced bathroom facilities with Massage and Rainfall Showers. Suite facilities: Individually controlled Air-conditioning, En-suite Luxury Bathroom, Massage Shower and Rainfall Showers, Separate Tub/Jacuzzi, Deluxe Toilet Amenities and Towels, Hairdryer, Bathrobe and Slippers, High-quality White Bed Linen, Fresh Flowers, In-house Telephone, Mini Bar and Safe, Complimentary Drinking Water, Safety Equipment and Life Vests. 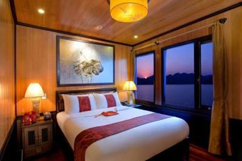 The luxury, large and cozy dining room are perfectly designed to let people freely enjoy the miraculous view of Ha Long Bay. It can serve 32 customers at a time. 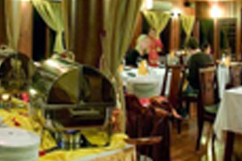 The main food in Indochina Sails is Vietnam traditional dishes prepared from local seafood. 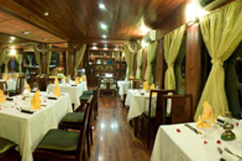 Besides, experienced chief of Indochina sails will consult and help you choose other delicious dishes from beef, chicken with fresh herbs and spices in the menu. According to individual or group bookings, we organize music show with traditional musical group. With the big screen in the centre of the dining room, you can enjoy films "Indochine" - an1992 Academy Award winning French film that tells the story of a young Indochinese woman named Camille. 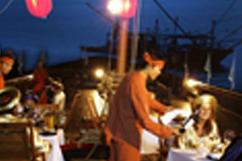 Indochina sails constantly developing newly-themed dinners and events and its Alacarte Menu.